The civil war was long since over. One side had won. One side had lost. But in 1929, the defeated commissioned a statue to honor the bravery of their ancestors. Neither confiscation of their property, the pitiless persecution of their kinsmen in revolt, nor the galling chains of inprisonment could break their spirits, or divorce them from a loyalty almost without parallel. Yes, the “civil war” I’m talking about is the “civil war” for British North America. A war in which American loyalists supported the king and American rebels supported independence. 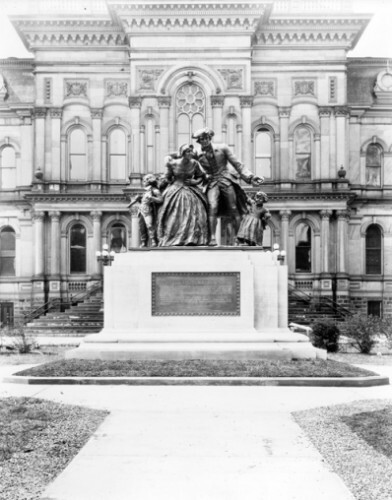 The statue is located in Hamilton, Ontario. I think you would be hard pressed to find a statue to the bravery of loyalists inside the USA. This does not mean there were no brave loyalists. It does mean that as a nation we have decided to celebrate the cause of Independence as the American cause. 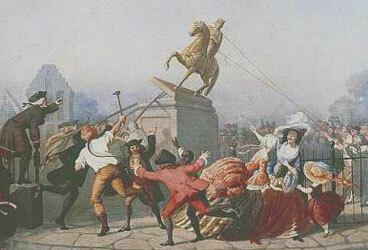 In fact, we started taking down statues at the very start of the revolution. Most famously, the statue of King George III was toppled by the mob (otherwise known as “the Sons of Liberty”) on July 9, 1776. To the best of my knowledge, no one made speeches about “erasing history” or the loss of British “heritage.” It was simply that the new nation stopped venerating kings, so keeping up a statue of a king in the public square seemed completely inappropriate. The ‘powers that be’ have been induced to appropriate two hundred acres, immediately around the house of General Lee, on Arlington Heights, for the burial of soldiers dying in the army hospitals of this city. …. The people of the entire nation will one day, not very far distant, heartily thank the initiators of this movement…. This and the contraband establishment there are righteous uses of the estate of the rebel General Lee, and will never dishonor the spot made venerable by the occupation of Washington. Though Arlington Cemetery is today a place of honor, its origins were in part a punishment for Lee’s decision to join the rebels. Most of the statues that honor the Confederacy were not erected in the immediate aftermath of the war but rather decades later as part of an ongoing effort to normalize the rebellion as a “war between the states” rather than treason against our national government. This was an effort that coincided with the interests of those who wished to persecute and marginalize African-American citizens. So for those genuinely concerned with efforts to change history, I would suggest reexamining the origins of these statues in the 20th century. The events of the last ten days have me thinking not only about American history but about my Jewish roots as well. As a kid, I always remember thinking that the Ten Commandments were rather uneven – mixed in with injunctions to avoid murder, theft, adultery and other behaviors that clearly harmed people was a prohibition on “graven images.” Back then I thought that this commandment was not only easy to keep but probably unnecessary in the modern world. After all, I didn’t know many idol worshipers. But seeing statues turned into quasi-religious vessels has caused me to reevaluate the merits of aniconism (prohibitions related to idolatry and sculpture). In addition to multiple references in the Torah itself, there is an entire section of the Shulchan Aruch dedicated to the topic. The prohibition is said to broadly apply to creating an image of “anything in the heaven above, on the earth below, or in the water below the land.” I feel reasonably confident that statues of generals, both Confederate and Union, are covered by this ban. Personally, I am comfortable with statues as art (if art was truly their purpose) and I am ok with statues as symbols of shared values (see my last post on the Statue of Liberty), but statues are not a substitute for history and we should not confuse respect for history with veneration of graven images – in my view that’s as problematic today as it was 5000 years ago.